The Working Time Directive provides that member states must ensure that every worker is entitled to paid annual leave of at least 4 weeks. This is implemented in the UK by the Working Time Regulations 1998. The WTR state that holiday to which a worker is entitled must be taken in the leave year in respect of which it is due and may not be replaced by a payment in lieu except on termination of employment. Leave cannot be carried forward to the next leave year without express agreement, usually in the contract of employment. In the case of Pereda v Madrid Movilidad SA (2009) the European Court held that if workers do not wish to take their holiday entitlement during a period of sick leave then the holiday must be granted at a different time, even if that means it is carried forward into the next holiday year. In the recent case of Plumb v Duncan Print Group Limited, the Employment Appeal Tribunal clarified two points that remained unclear following the above decision. Mr Plumb was off on long term sick leave for 4 years following an accident. Upon the termination of his employment he claimed payment for 60 days accrued holiday for 2010, 2011 and 2012. • Sick workers do not need to provide evidence that they were physically unable to take holiday. If they do not take or request holiday during sick leave it is to be assumed that they are unable or unwilling to take it and accordingly that leave may be carried over to a subsequent leave year. The right to carry forward unused annual leave applies only to the 4 week statutory annual leave entitlement. Employers are not obliged to allow any extra holiday entitlement to be carried forward. • The worker is permitted to take annual leave within 18 months of the end of the leave year in which it accrued. The Directive does not require national law to permit unused leave to be carried over indefinitely. At most it requires that workers who are on sick leave may take their annual leave within 18 months of the end of the relevant leave year if they were unable or unwilling to take it because they were sick. On this basis the EAT held that Mr Plumb was entitled to payment in lieu of annual leave for 2012 but not for 2010 or 2011. The right to take annual leave for 2010 and 2011 had been lost as it had not been taken or requested within 18 months of the end of the leave years. IRecent reports claim that David Cameron is seeking the return of an opt-out from EU employment laws as part of his renegotiation of the UK’s relationship with Brussels. The opt-out was surrendered by Tony Blair in 1997 and since then the UK has become bound by far reaching directives that regulate many aspects of businesses from equal opportunities to health and safety. The laws are regarded by many businesses, especially small businesses, as costly, intrusive and complex. Mr Cameron wants sovereignty over employment laws to return to the House of Commons. As a minimum demand he will call for Britain to be exempt from two key European Directives on working time and equal rights for temporary workers. Estimates say that the rules cost the NHS alone billions because hospitals are forced to hire temporary staff to fill gaps in rotas caused by EU regulations to give junior doctors time off work. 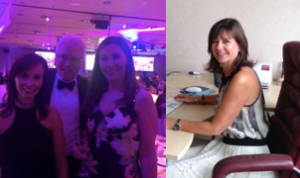 Sarah, Adrian and Natalie Recently attended the Nottingham Food and Drink awards at the Nottingham Conference centre and enjoyed an evening hosted by MasterChef’s Greg Wallace. Premier Legal have a new team member. Claire Gibson has joined as our Marketing Manager. Acas (Advisory, Conciliation and Arbitration Service) has published statistics showing the results of the first full year since the introduction of early conciliation. The requirement for employees to complete early conciliation before submitting an employment tribunal claim was introduced on 6 May 2014. The aim is to provide an opportunity to resolve disputes between employers and employees without the need for a tribunal claim. The statistics show that early conciliation is working effectively in reducing the number of claims that proceed to tribunal. Acas dealt with over 83,000 cases between April 2014 and March 2015 with over 1,600 cases being referred to them per week over most of the period. Of the cases that were received between April and December, 63% did not proceed to tribunal, 15% resulted in a formal settlement through Acas and 22% proceeded to tribunal. Of the 22% that proceeded to tribunal more than half were subsequently settled through Acas. Acas conciliation is still available after a tribunal claim has been lodged right up until the hearing date. Once a notification is made to Acas, there is a one month extension to the legal time limit within which the employee must bring a tribunal claim should they decide to do so. This ensures that there is time for discussions to explore a possible settlement. If you receive notification of a potential claim from Acas you are likely to require expert advice on the merits of the claim and potential value in order to make an informed decision regarding settlement. Please contact us and one of our specialist employment lawyers will be able to deal with this process for you with a view to minimising your exposure to costs and compensation and the amount of management time you need to spend on dealing with it. An Employer has been ordered to pay 90 days gross pay to each employee after failing to collectively consult as regards to proposed redundancies. The Tribunal and EAT held that the fact that the employer was unaware of its legal obligation was not an excuse and they could not rely upon the special circumstances defence. The EAT’s decision also serves as a reminder that the award is not to compensate the employees for loss but it is rather a punitive measure levied towards the employer. If you have less than 50 employees your staging date will be getting closer and will be a date between 1st June 2015 and 1st April 2017. If you are not sure of when your staging date is, you can check on the Pension Regulator’s website. You will need your PAYE reference to hand. Alternatively, please contact us and we can assist you.